On windsurf slalom fins. Personal experiences and preferences. What is meant with "slalom sailing" in this context - and what are the consequences for the gear preferences? What is slalom sailing? Well, in a discussion on the Maui Sails Forum (http://www.mauisails.com/forum/viewtopic.php?id=2656) the definition kind of ended up with a rather formal competitive approach, meaning that slalom sailing is something about organized figure-of-eight or downwind competitions. That might be true, but I don’t think that the majority of slalom boards are used this way – at least not at my place. Of course riding a slalom board reflects a kind of competitive mind in the sense that most of us want to be the fastest (or at least not the slowest!) guy in the gang. For most of us that's probably a pretty unrealistic ambition, but that’s nevertheless the main purpose for sailing a slalom board. But for most of us the “competition” is mostly carried out in a much more informal way than organized slalom around buoys: Frequently this informal competition starts with hunting the guy who happens to sail somewhere ahead of you. If you’re lucky enough to start catching him up, of course the leading guy starts sailing what he thinks is his most competitive course (beam reaching, upwind, downwind) to shake off the pursuers. Now, if the guy in front doesn’t do an easy trick to avoid “humiliation” (for instance by jibing), and the pursuers catch up to him, the really fun and exiting battle can begin: The attempts of the pursuers to overtake him closer to the wind or downwind – and the leading guy’s effort to place the pursuers in his dirty air. Most often when the result of the battle is settled or obvious, one of the guys jibes, the “competitors” do the same – and the same kind of battle can begin again. Is this obvious difference between informal slalom sailing and organized slalom sailing important? I think so: Organized slalom tend to cover a much shorter geographical area, increasing the chances for more constant winds strengths and predictable water state. Sailing directions also tend to be more predictable, and all this probably favour a more specialized and “narrow” choice of gear (board, fin and rig). The informal slalom “competition” often implies longer legs, more continuous time on the water with unpredictable water states and wind strengths: Are there chaotic waves out there? Are there belts of weeds? And what about local weather shifts, and so on. Furthermore the leading guy more or less determines the sailing direction, and if he finds out, that he can gain distance by going excessive depth or very close to the wind, you can be damn sure he’ll do his trick. All in all the informal slalom sailing will favour a comparably more ”robust” setup – for instance gear being able to continue planning through the lulls AND being controllable to save you through a thunderstorm, or the fins being powerful enough to prevent you from spinning out when kissing the tiniest little piece of weed. In the mentioned “fin-selector” from Select Hydrofoils the recommended “match racing” fins tend to be marginally larger (and more powerful) than the recommended “PWA-slalom” fins. What to look for: Some (personal) experiences with different slalom fins (brands/models). After a long journey in the land of fins I ended in a love affair with Select Hydrofoils slalom fins. The SL7 series fins were the kind of fins I had always dreamt of: Powerful for the sizes, lots of grip, no spin out tendencies (tolerate more weed clinging to the foils than any other fins I’ve tried), manageable in the gusts and relatively cheap. Have you ever tried buying fins from Deboichet or Hurricane? Well, some clicks on the Select Hydrofoil homepage, and a couple of days later you receive the fins asked for! A WARNING: If you accept Select Hydrofoils invitation to give a feed back, don’t be surprised to be either ignored or to receive a caricature of a Franco-arrogant, touchy and self-righteous response with a know-it-all attitude, that de Gaulle would have envied. However loving the performance of my Select SL7s, RS7s, S07s and R07s, recently my SL7/RS7 fins ran into massive durability problems, and after trying to have a kind of explanation from Select Hydrofoils (in vain, see the not-answered page made specifically for the company: http://peterman.dk/windsurf-select-slalom-fins01-780.htm), I reluctantly had to try a couple of other brands in search for some new standard fins. On the bright side, this gave an opportunity to compare some other slalom fins with the SL7s – and hopefully it could also give an idea of good and bad fin shaping and material. To replace my broken Select SL7 39 cm fins (used with a Tabou Manta 74/North Warp 8.0 in powered up conditions) I bought a MFC RC2 40 cm fin. To replace my broken Select RS7 41 cm fin (used with a Tabou Manta 74/North Warp 8.0 in light winds) I bought a MFC RC2 42 cm fin and a C3 Venom 42 cm fin. To replace my broken Select RS7 45 cm fin (used with a Tabou Manta 79 and 85/NP RSR 9.0 in powered up conditions) I bought a MFC RC2 46 cm fin and a C3 Venom 46 cm fin. In short, the replacing fins weren’t successful at all. In spite of buying them a little longer than the Select fins they were supposed to replace, they all felt too powerless and prone to spin-out if they were loaded just a little. As for speed – it was such a pain to gain the height necessary to allow downwind speed that this quality wasn’t examined much. But for 90 % of the sailing time the fins didn’t produce enough lift (the boards went sideways and the windward rails were pushed down in the water) – and that’s not exactly the prescription for speed. Rather surprisingly there didn’t seem to be much difference in the lack of performance between the MFC RC2s and the rather expensive (in my country) C3 Venoms. Maybe the fins simply had to be chosen much larger than the Select fins to compare in performance? 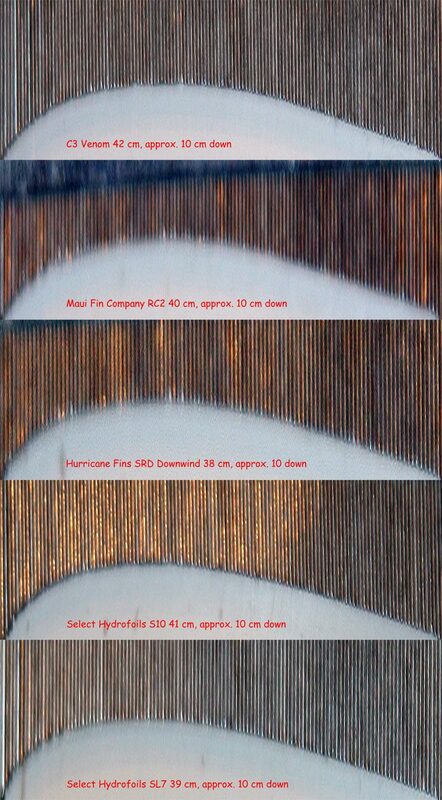 Consequently the MFC RC2 42 cm and the C3 Venom 42 cm were tried in conditions, where the Select SL7 39 cm fin was normally chosen. But even being 3 cm longer than the “standard” fin for the conditions, they still weren’t good enough, and switching back to the (temporarily repaired) SL7 39 cm fin was like being in heaven again. Of course, one has to accept that liking or disliking fins can be a question of “taste” and subjective preferences, but anyhow the decline in performance from the Select fins to the MFC and C3 fins was so pronounced that I got really curious: Could the reasons for the decline be detected with reasonable certainty – and if so, what to look for when buying fins - and is there a possibility to modify a bad fin into something that functions? All the fins (good and bad) had close to the same thickness, so this (probably important) issue wasn’t considered a variable here. A well known US fin-maker once told me that the last 25% of the fin width towards the trailing edge has to be "dead flat" (a statement later vigorously rejected by Stéphane Mocher (mail from 130409) from Select Hydrofoils)). The reason for this “dead flat” section should be to minimise the pressure difference towards the trailing edge – and in this way hinder ventilation tendencies (or spin out) of a fin. The Select fins, in fact, seem to be a little bit more convex towards the trailing edges (i.e. not “dead flat”) than the bad fins. Therefore, just to make quite sure that the break-away tendencies of the bad fins weren’t caused by too much (or inexpedient) profile towards the trailing edges, one of the bad MFC fins was sanded a couple of minutes in this area. No detectable change in performance was detected. The Select fins are clearly stiffer (and probably have less twist) than the bad fins. Consequently, one of the bad MFC fins was sanded a little, and then a couple of layers of carbon cloth were laminated to the fin shaft (picture here). Except from having to repeat the laminating process a couple of times (with still harder vacuum pressure) to keep the new layers from separating from the fin core (the fins flexes and bends a lot during sailing! ), this wasn’t the clue either: I THINK the fin got a little more “bite”, but honestly this could also be a consequence of tiny inaccuracies when adding/sanding the carbon layers (i.e. changes in the fin profile). From formula fins we all know the importance of rake, and as the C3 fins are pretty much raked back compared to the Select fins, the next thing to try was to rake one of the C3 fins more forward (with a somewhat exaggerated angle, picture here). Testing showed that the gutlessness of the fin kind of disappeared, and you planed a little earlier. However, the fin didn’t seem to be able to withstand (over-)loading much better without spinning out, and (most importantly) the board started tail-walking much earlier than usual in the gusts. So in short – better “bite”, but less wind span. The fin was later raked a little back to the same angle as the Select fins (78 degrees) – but the result of this more moderate raking forward hasn’t been tested yet. But what about the leading edges of the fins? It seems that without being (much) thicker, the Select SL7 fins differ from MFC RC2 fins and C3 Venom fins in that they exhibit more profile very close to the leading edge, and (not as obviously so) in that they have the maximum profile depth more forward. To try to visualize this impression some of photos were taken from “castings” from some comparable fins (in size). The castings were taken approx. 1/4 down from the fin head, and the photos were then resized to have the same width (in pixels). To make more obvious the differences in profiles the height of the photos (or the thickness of the profiles) were multiplied with 4. Of course this is certainly no science, but I think you can conclude from the photos that there’s a lot of difference in the distribution of the profiles from the two fins in the top of the illustration (the C3 Venom and the MFC RC2) to the fin in the bottom (the Select SL7). the C3 and the MFC fins. compared to the C3 and the MFC fins. So, the Select SL7 (and that goes for the S07 too) is pretty obviously sticking out, and the question is if these differences in profile characteristics are responsible for the huge performance differences (given the mentioned sailing format) between the fins? Is this the reason why the SL7 is so much better than the other two fins? more abruptly around the leading edge with increased risk of creating turbulent "flows". But isn’t there a penalty to pay for sailing a “blunt” fin – i.e. isn’t such a fin simply plain slow? Well, logically the Select SL7 would produce more resistance/drag than the MFC and C3 fins with their smaller angle of incidence/max profile and more backwards/no profile towards the trailing edge, which you can easily imagine "cutting" through the water. But on the other hand, the superior "bite" of the SL7 kind of allows you to downsize the fin somewhat in length compared to more powerless/speed-oriented fins - and thus the expected unfavourable extra drag of the SL7 fin perhaps isn't felt as much as one could fear(?). Excuse me for the analogy, but (to my very limited knowledge) if you examine the wind resistance of a car you’ll of course have to look at the Cw value – but you’ll ALSO have to look at the front area of the car. On other words – as to wind resistance a favourable Cw can be ruined if you increase the front area. Talking about fins this emphasizes that if you examine the speed potential of a fin it's not enough to look at the profile - you'll also have to look at the length necessary to compensate for a "speedy" profile. To give you an indication of the potential lack of speed we’re talking about when comparing a SL7 slalom fins with a more speed oriented profile design, “RS-Peter” (Dutch speed champ) in the Fanatic forum recommends the Select S07 (same profile as SL7) in speeds under 60 km/h prior to the more speed oriented Select Casper fin (http://www.fanatic.com/forum/read.php?1,18397). Have you ever touched 60 km/h? Well, I certainly haven’t during less than total perfect conditions, and probably never in real life, match racing conditions! And I'm certainly very prepared to pay for excellent fin-performance under 60 km/t with the risk of being overtaken by guys sailing more speedy slalom fins the very few moments in my life I ever cross this magic limit! If time is found during the summer period I will probably try to modify some of the bad fins to something that functions by applying some "material" in the apparently crucial area next to the leading edge. I'll let you know if this improves the fins, as I expect it might.